-SG- ... is a subject about which I have only superficial knowledge and the recent article by Bob Zwarts which appeared the Vintage Motor Cycle Club magazine, entitled 'Push-rod Performance -1930's Style' is well worth a read. This covers the racing activities of Walter Bibby at Donington - starting with a home-brewed 588cc Model 19 outfit. Bob has given us permission to use his copyright text (many thanks!) on the site (below) while the accompanying photos are also acknowledged to various sources. The Donington photos are on Flickr (click this link) and show period shots of the leading Norton outfits - and their opposition - at this point in racing history. Background - In 2013 I became involved in identifying a historically important collection of very high quality photos from the 1930’s. These photos were rescued, by Richard Jones, from being individually sold and the collection dispersed. 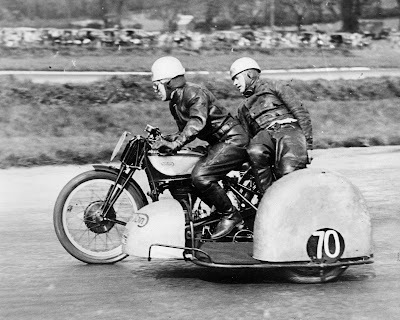 They featured sidecar/three wheeler races at Donington Park circa 1934 - 1939. The full collection, which led to Richard and myself writing a book about the racing at Donington in this period, can still be viewed on the web via this link. On first seeing the photos, one outfit in particular stood out as being of special technical interest. This we subsequently identified as the Norton sidecar outfit of W. Bibby from Wallasey, at the May 1937 event, probably taken at the Donington ‘Hairpin’, now known as ‘The Old Hairpin‘. Now if you look carefully you will see that the engine is not, as you would have expected, an OHC Norton, but a humble pushrod engine. At this point, you may be forgiven for thinking that Mr. Bibby is enjoying a ride out with the ‘stars‘, on their genuine racing Norton outfits, with little hope of success. Not so. Look again. This is obviously no ordinary Norton pushrod engine. A press report from 1937 described the Norton as ‘home tuned, having an extra large aluminium barrel and a bronze alloy head’. The appearance of the front brake suggests it has also received some serious attention and is not quite as it left Bracebridge Street. My initial conclusion - Walter was probably a man of considerable engineering skill and ability. Subsequent discoveries proved this to be correct. Further research produced such a fascinating wealth of detail that we would like to share it more fully than was possible in our book. Much of this information came from Walter Bibby’s nephew, Roy Hoiles. Roy is the M.D. of Bibby Precision Engineering. This is the firm founded by Walter Bibby in the 1930’s and now based at Bromborough on the Wirral. Roy, who was trained in precision engineering by his uncle, is rightly proud of Walter’s achievements. Fortunately for those of us with an interest in racing history, Roy has carefully preserved many documents, photos, trophies and other items relating to Walter’s racing career. This material gives a unique glimpse into the early days of sidecar racing here in the U.K.
Walter Bibby was born in Wallasey in 1910. From the photos and newspaper cuttings we believe that he started racing in 1935, possibly earlier, at Park Hall, Shropshire. Walter quickly became skilled in a very special minority interest, he raced a sidecar outfit. This was at a period when track racing in England was enjoying something of a surge in interest. Due to our restrictive laws regarding road closure we have no tradition of true road racing on the British mainland but at this time grass-track racing was very popular. “Sidecars came next - that is to say, motorcycles equipped with outrigger wheels, a platform and as many grab handles as might be found on a double decker bus going about its normal business. E.R.Evans (499cc Rudge) had a hectic trip, but his front wheel was often enough on the ground to maintain or change direction as required. The passenger of F.Eastwick’s O.E.C. - JAP outfit was thrown off his little platform but caught a grab handle and held on. For yards he was trailed like a comet - presenting his reverse and obverse contours to the road surface. Then he did some “giant strides” at about 40 m.p.h. and was finally bounced back on board - not normally seated! Only later did the driver learn that the applause was not for his skilful handling round the S bend”. We can only hope that the poor passenger’s ‘contours’ did not suffer permanent modification from this diversion. It was in this prevailing milieu that Walter Bibby made his first steps into a successful racing career on three wheels. Syston Park , Lincolnshire, was first used as a road race circuit in 1926 and Park Hall similarly but then came the 1930’s and Fred Craner. This remarkable man was the driving force behind the rapid rise to pre-eminence of the Donington Park circuit. That’s a separate story in itself, so now I will return to Walter Bibby and his pushrod Norton outfit. It appears, from the stated capacity, to have been based on a 588cc (79mm X 120mm) Model 19 Norton and therefore of pre-1933 vintage. The earliest photo we have of the outfit in this initial form is from Park Hall 1935. His first appearance at Donington was on Easter Monday 1936. He entered two races, the 10 lap handicap race for 350cc - 600cc sidecar outfits and the 10 lap handicap race for 350cc - 1100cc ‘passenger machines’ i.e. sidecars and three-wheelers. The formidable opposition on the day included established ‘regulars’ - Harold Tozer (596cc Norton), Bill Rose (596cc Norton), Len Taylor (490cc Norton), Henry Laird (‘Red’ - supercharged 1084cc JTOR JAP - Morgan) and Cyril (Charlie) Hale (Morgan -MX4). In the first race, Walter finished in fourth place, almost 2 ½ mins. behind the winner, Bill Rose. In the second race he improved on this with faster lap times, we have copies of the original lap time sheets, to finish third behind Bill Rose and Len Taylor. In fairness to the opposition it must be mentioned that Laird went out on lap 5 with an oil pump failure whilst Hale retired on lap 4. For reasons unknown and despite his initial success, Walter did not appear at Donington Park again during 1936. We do know that he raced at Park Hall, in the August Bank Holiday Monday event, winning both sidecar races outright. We can also speculate that having the experience of racing against the top British sidecar teams of the time, he simply went away and took ‘time-out’ to develop his Norton outfit and make it more competitive. Our first photos and descriptions of the resulting ‘special’ outfit date from its appearance at the Derby and District motor Club’s Donington event, Easter Monday 1937. 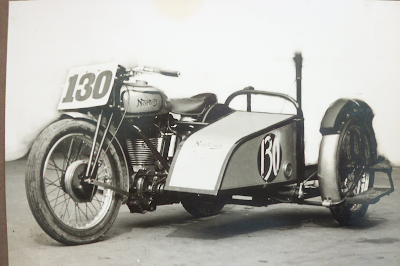 Walter, entered as no.130, was riding in the 350cc - 1100cc sidecar & three-wheeler handicap race. The start of this race was postponed to allow Henry Laird to make urgent repairs to the Zoller supercharger fitted to his 1084cc Morgan “Red”. The blower blades had ‘picked up’ during practice and required some extra clearance. There were only four entries for the class, the others being Walter Bibby 588cc Norton, R.Evans 595cc Grindlay-Peerless JAP, and Len Taylor who now had a 596cc Model 30 Norton. The sidecars had a 40 sec. start over the Morgan with Taylor taking the lead which he held to the end of the 10 lap race. Laird, with co-pilot and brother in law, Michael Faraday, was going very well and passed Evans and Bibby. He may well have passed Taylor, given another lap or two. So, on his first appearance with the heavily modified 588cc Model 19 Norton special, Walter achieved a creditable third place behind the 596cc Model 30 Norton of the very experienced Len Taylor and the blown Morgan of Henry Laird. It is worth noting that this result netted a prize of £10 for Taylor and £4 for Bibby, with £1 and a half pint tankard for Taylor’s passenger, Stan Nicholls. Whilst this might not seem very much reward, comparison using an inflation calculator shows these payments equivalent in today’s value as £600, £245 and £61 respectively and also gives an indication as to the healthy financial status of the Derby and District Motor Club at the time. Walter’s next appearance at Donington was a few weeks later, at the 1937 Whit. Monday event where he rode as no. 154 in the 10 lap sidecar and three-wheeler handicap race, as shown in photo no.1. We also have the lap time sheet for this event and for the first eight laps, the Bibby Norton was consistently achieving an average lap speed around 55mph. This comfortably exceeded the race average of the winner V.S.Graham (595cc Grindley JAP) at 53mph and Cyril Hale’s Morgan at 51 mph. Following the retirement of Len Taylor’s Norton with plug trouble and Henry Laird’s Morgan with the magneto coming loose on its mountings, Walter’s Norton led the race until forced to slow down in the final two laps due to fuel starvation, finally running out of fuel completely at Starkey’s corner, just within pushing distance of the finish line to secure second place. 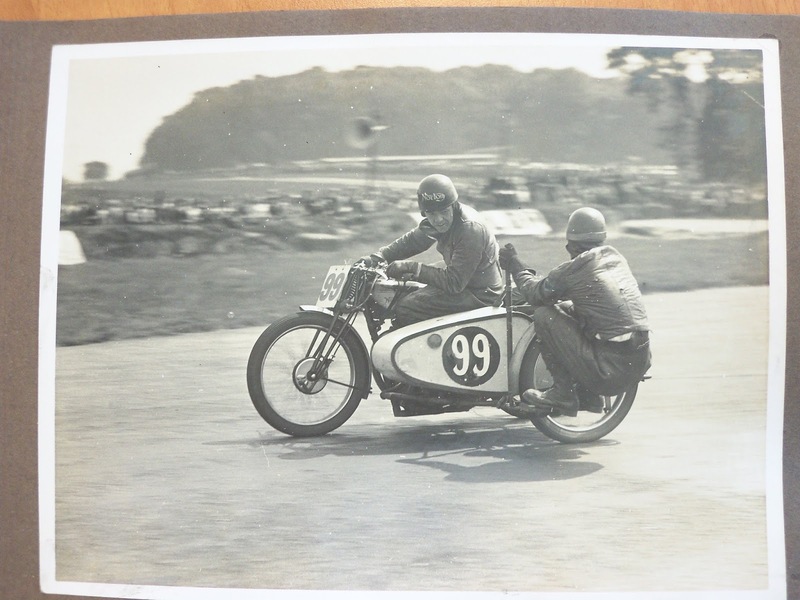 The race was won by Versey Graham, Versey being the elder brother of Les Graham, yes THE Les Graham, winner of the inaugural 500cc World Championship in 1949 riding the AJS Porcupine. Les rode as passenger for Versey on occasion. This was to be the swan-song for the Bibby pushrod engined special, at least as far as Donington is concerned. At the August Donington event, Walter was riding an OHC Norton 596cc Model 30, but I will come to that later. Now is a good time to examine the details of the 588cc Norton and try to follow Walter’s thinking on what was required to build a machine which would stand the considerable rigours and stresses of racing on three wheels. For these details, I am again indebted to Roy Hoiles in allowing me to view and copy the original photos and to Archie Beggs for a first hand description of some features which he remembers from later appearances of the 588cc outfit in events at Oulton Park and Rhydymywn during the 1950’s. As previously mentioned, the cylinder barrel is a light alloy casting encasing a cast iron liner, with a large area of cooling fins from the level of the crankcase to the base of the cylinder head and partly encircling the pushrods. Particularly important with this engine as we think that it was fuelled by petrol, not cool running dope (methanol). 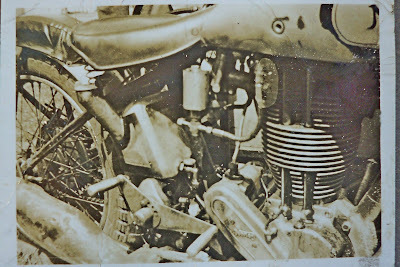 The cylinder head was a one-off item, cast in Aluminium-Bronze. This material, having greater thermal conductivity than cast iron, permits a higher compression ratio to be used, giving a significant power increase. Archie Beggs suggested that the head would have been cast locally at the Manganese Bronze foundry to patterns made by Walter, or at least to his design. Roy Hoiles confirmed this possibility as he remembers Walter turning bronze ‘test pieces’ for the Manganese Bronze foundry. Here we find a connection with another of the principal players in this story - Henry Laird was a grandson of the founder of Cammell - Laird, the shipbuilders. Based at Birkenhead, their ship propellers were cast at Manganese Bronze, probably alongside Walter’s unique cylinder head. There’s yet another link, Manganese Bronze eventually became the owners of the Norton name. Moving down the engine, the drive side crankcase has a large, webbed, circular plate extending from the main bearing housing to the circumference of the crankcase. Clearly visible in Photo 2, this is another bronze casting, the benefits of which would be threefold. It would give extra support to the drive-side crank which, at this time, only had a single drive side main bearing. The 588cc Model 19 has an ‘open’ frame i.e. the crankcase forms part of the lower frame and the lower front sidecar attachment is mounted here, so the additional strength deriving from the bronze plate would distribute the stresses induced by spirited cornering and acceleration. Lastly, it would help to prevent the drive side crankcase wall from breaking away. This is a known failure, apparently peculiar to sidecar racing. Gyroscopic forces generated by the flywheel/crank assembly resist lateral changes of direction during fast cornering. The reaction force, being provided by the drive side crankcase, places considerable stress on this component. Pre-unit Triumph twin engines are noted for this failure, as anyone who frequents the paddock of VMCC racing events will know. Moving on to the cycle parts, the front brake drum and brake plate appear to be made in light alloy, the drum being ribbed and of significantly larger diameter than the original and presumably constructed as a shrunk on ‘jacket’ around an iron liner. The sidecar wheel is also braked, operated via a cross shaft carried in bearings mounted on the chassis and linked by rod to the brake cam arm. The sidecar body is a very neat design, devoid of the more usual nest of tubes and grab handles and carries a road tax disc. In other photos the outfit bears the reg. no. HF4080. Walter probably enjoyed a bit of unofficial practice, as we all do. The sidecar wheel spindle is extended outboard to a small platform for the passenger to stand on when ‘hanging out’ for a left hander. All in all, the outfit shows some very clever thought and logical design, executed to a high standard. Now we come to what might be called the second phase of Walter’s racing career. Between Whit. Monday and August 2nd 1937 he had acquired a Norton M30 596cc outfit. I believe that this was in fact the outfit raced very successfully by Bill Rose between 1932 and 1936. We have photos of Bill Rose at the Aug.1936 Donington meeting (his last recorded appearance at Donington) and Walter’s first appearance with the 596cc M30 Norton in Aug 1937. In both cases, the sidecar body has the same distinctive features and the two outfits are identical in visual appearance, with one minor difference, Walter has added his road tax disc holder. Later, following a break for lunch and the 250cc and 500cc solo races, the 10 lap ‘Passenger Grand Prix’ produced another win for Taylor who was unbeatable on the day. Laird led by the end of the first lap despite his handicap start but was destined not to finish this, his last ever, race at Donington. The Morgan’s engine began to seize due to a fractured oil pipe and he was forced to retire. Ted Bury finished in second place with Horton third. Further back, Evans and Graham did not complete the distance, nor did Bibby who was said to have ‘ridden a good race, as long as it lasted‘. Walter was probably still suffering the effects of his earlier incident. His first event on the ‘new’ machine could be described as somewhat traumatic but riding an unfamiliar machine to the limits of what is possible is, by definition, a learning process and 1938 was to prove that he had absorbed the lessons well. Now we come to Walter’s last season of racing at Donington. By 1938 he could be considered a seasoned campaigner, able to ‘mix it’ with the best, and on an equal footing now that he was equipped with the 596 M30 Norton outfit. Over the winter, the sidecar had undergone a radical transformation. It is very possible that the original body work was too badly damaged in the Aug.’37 incident, or he decided that he wanted something lighter and minimal. There was now no bodywork beyond a simple nose-cone and mudguard over the sidecar wheel. Jackie Beeton had a 20s. start from Len Taylor, but was soon caught and passed by Taylor. Beeton held on to second place until the sixth lap when he was passed first by Bibby, then Tinsley and this was the finishing order. The second sidecar/three-wheeler race was more exciting as it featured three separate battles. As before, Beeton took an early lead but the fight for first place quickly developed into a contest between Taylor and Arthur Horton. Horton’s outfit appeared to have the edge on speed down the straights, possibly due to carrying more corner speed as it was now set up to use the ‘front exit’ passenger technique on left hand corners. Horton finished not only in first place but also broke the sidecar lap record at 61.34 mph. The second duel, between Beeton and Bibby for third place went to Bibby, with Beeton finishing fourth. Meanwhile, George Buck was successfully challenging Graham for fifth place. Taylor and Beeton both broke the 60mph barrier and must have finished very closely, but third place man Bibby was only 30s. behind the winner with an average speed of 58.87mph. The next Donington event was on Whit. Mon. 6th June 1938. The day began with a thin drizzle and high winds, not ideal racing conditions, but still attracted a good sized crowd and produced a new sidecar lap record. 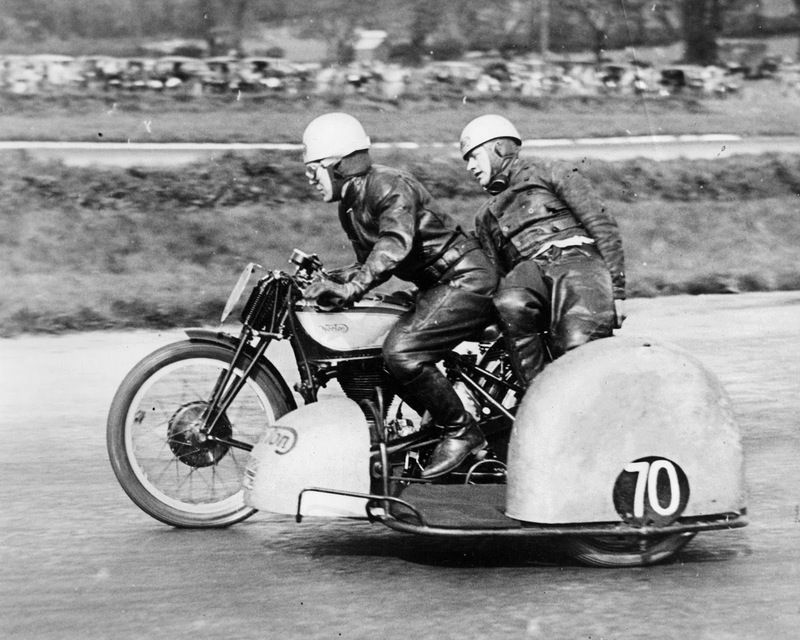 The first of the two sidecar / three-wheeler races featured seven outfits and three Morgans. Len Taylor took an early lead and was only challenged, unsuccessfully, by Horton who in turn was challenged strongly by Bibby, until a sidecar wheel puncture put Bibby out of contention on the sixth lap. This was disappointing as Walter’s battle with Horton had reduced his lap times to within 4s. of the lap record, set by Horton at the previous event. The race was won by Len Taylor at race record speed with Horton in second place. Phil Heath (Morgan - Blackburne) held on to a lucky third place, his top gear drive chain breaking as he crossed the finish line with Graham in fourth position. In the second race, Taylor again stormed off into a decisive lead with Horton in hot pursuit and that’s how the race finished, with Bibby in third place and F.E.G. Radcliffe (490cc Norton M30) in fourth place. Taylor again broke the sidecar race and lap records at 61.67mph. By contrast, in this race, the Morgan men were struggling. Hale came off the circuit at Redgate corner ( a left hander in this era) regained control but then retired with a seized engine and Phil Heath retired with mechanical problems in the second lap. Len Taylor and passenger Stan Nicholls must have been very satisfied with their performance and with their 596cc Norton, on that day they were seemingly unbeatable. Now we come to Walter Bibby’s finest performance at Donington. The August Bank Holiday event was held on 1st Aug. 1938 and was split into two distinct sessions. In the morning, all classes, including the sidecars and three-wheelers were to race over the relatively short distance of four laps, approx 12 ½ miles. Then after a break for lunch, the “Grand Prix” races would be contested over 16 laps (50 miles) for the solo classes and 8 laps for the sidecar/three-wheeler class. The first sidecar race seems to have been relatively uneventful. 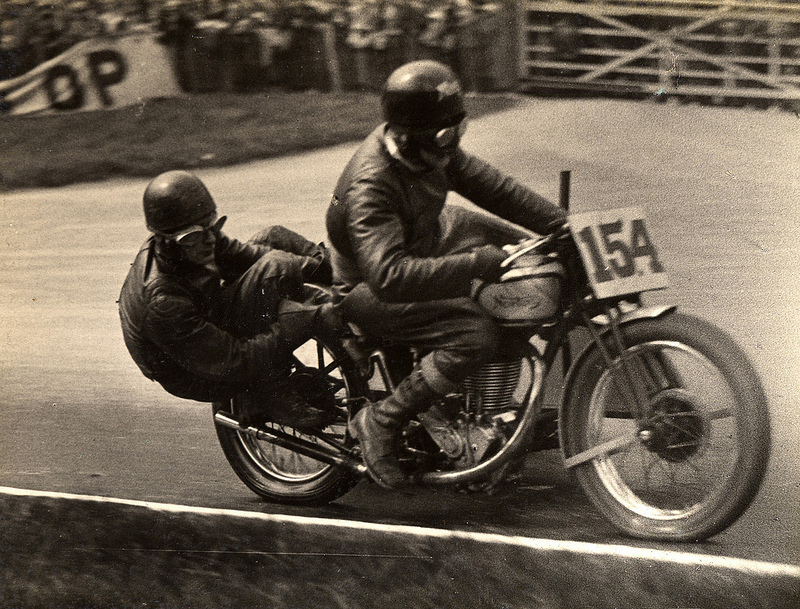 J.Varlow, riding Ratcliffe’s 490cc Norton outfit, was given a 40s. start, ahead of the 596cc Nortons and the sole Morgan entry, Charlie Hale. The 4 laps proved insufficient for Taylor and Hale to catch Varlow despite trying all they knew. Horton’s challenge was defeated by an oiled plug on the first lap and Hale, whose engine was by then firing on only one cylinder, had to give way to Evans (490cc Rudge) on the last lap. In the attempt to catch Varlow and stay with Taylor, Hale had raised the lap record for the class to 62.09mph. Walter Bibby is not mentioned in the results for this race. 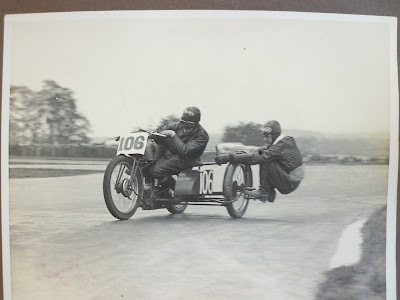 After lunch, the 8 lap sidecar and three-wheeler Grand Prix race began to shape up well with a major battle for supremacy between Bibby and Taylor, with neither prepared to give any ground. The outcome was an uncharacteristic loss of control by Taylor who left the circuit at Redgate, losing his passenger and eventually coming to rest “very shaken” and out of the race. Meanwhile, Bibby was now engaged in battle with Horton but Horton also left the race, albeit less dramatically. His carburettor float chamber had succumbed to the vibration and fractured, putting him out of the race and giving Bibby first place which he held the end. He was followed home 53s. later by Varlow and then E.R.Evans (499cc Rudge) in third place. It could be argued that Walter Bibby and passenger won this race by default, however there is an undeniable fact to refute this. In the course of the race they had raised both the race and lap records. This made them the fastest men on three wheels around Donington at the time and must have given Walter and his unnamed passenger, about whom we know absolutely nothing, tremendous satisfaction. They had come a long way in the sport, in a relatively short time. That would normally be the end of the season for motorcycle racing at Donington but 1938 marked the 50th Anniversary of the invention of the pneumatic tyre by John Boyd Dunlop. On 11th. August, ‘The Motorcycle’ was reporting a large entry for the Dunlop Jubilee event to be held at Donington on 27th Aug. On the day, a crowd of 20,000 spectators was recorded. The LMS Railway Co. was running a special train, leaving London Paddington station at 0825 and arriving at Derby at 1125. This allowed for travel by bus to the circuit in time for the racing which was due to commence at 1415. An illustration of just how important Donington Park had become under the management of Fred Craner and the Derby and District Motor Club. The 5 lap sidecar and three-wheeler race was programmed to start at 1530hrs. Alfred Kirsch (100cc Universal -JAP) set off very quickly, demonstrating why he was the 1936 Swiss National sidecar champion (1000cc class). Kirsch was closely followed by Bibby and Horton, Horton having recently won the sidecar race at the 1938 Swiss Grand Prix. Behind these three contenders, Hale was driving his 8/80 JAP -Morgan with considerable élan but Taylor was, unusually, suffering from engine trouble and not showing his usual form. Horton managed to pass Bibby and set off after Kirsch, catching him on the fourth lap when the Universal-JAP retired with engine problems. ‘The Motorcycle’ reported that the action was heart stopping with front forks whipping about as though they were made of elastic and Charlie Hale coming round a right hand bend, in the middle of the sidecar pack, in a spectacular fashion. This superb race ended in a win for Arthur Horton, with Bibby only 5s behind followed by Hale. Horton’s outfit was by this stage, technically years ahead of the opposition here in the U.K. It featured suspension on all three wheels, a padded platform and passenger front exit provision, along with much cleaner aerodynamics provided by the alloy sidecar wheel cover and nose cone. So advanced that it did not look out of place in the early 1950’s when sidecar racing took its next steps forward following the establishment of the World Championships in 1949. It is worth noting that the benefits of these advances were still the subject of debate into the 1950’s by leading exponents such as Eric Oliver, Cyril Smith, Pip Harris and Ted Davies. The racing career of Walter Bibby, at least so far as Donington Park is concerned, came to a close with that late August 1938 event. We have been unable to find mention of him in any of the 1939 programmes or reports. So what became of the unique 588cc Norton M19 special? Archie Beggs recalls seeing it in competition throughout the 1950’s and into the early 1960’s, suggesting that it did not leave the Merseyside area. Sadly, he also remembers that it was finally scrapped. The early ’60’s was a time when interest in preserving our racing heritage was at a particularly low point. If only someone had the foresight to rescue and preserve this machine, what a wonderful sight and sound it would have made in Vintage Racing today. As for Walter, his nephew Roy tells me that apart from his engineering business, he had two big interests in life - Motorcycles and fishing. Paddock photos suggest that he greatly enjoyed his racing and the results show that he was competitive at the top level of the sport. Personally I like to think of him as a pioneer, pushing the limits of his riding skill and his machines in a relatively new, exciting and rapidly developing branch of motorcycle sport. With the 588cc Special he had so much in common with those who were to follow much later, in Vintage racing, seeking to develop apparently unlikely machines into race-worthy devices - but not always with Walter Bibby’s degree of success. The photo acknowledgements are as follows - Photo 1 and 6: Bob Light and Mike Lawrence. All others Roy Hoiles.